When asked when Jesus was born most people in the west would say December 25th and if you ask people in the east they would answer January 6th, but they would both be wrong. The error in dating was caused by Dionysius Exiguus, a Roman monk-mathematician who made a numerical error in the calculation for the date of the nativity (753rd year from the founding of Rome instead of 749 which is when Herod died). Most scholars understand the date of Jesus’ birth to be between 6 and 4 BC. We know that Herod the Great died in the spring of 4 BC and was present during the visit of the Magi at the nativity (Matt 2:1). Josephus tells us that Herod died after a lunar eclipse (Josephus Ant. 17.6.4) and before the springtime Passover of the Jews. It is known that there were four lunar eclipses between 7 and 1 BC. They are on the 23rd of March, 5 BC with 29 day between the eclipse and Passover; on the 15th of September, 5 BC with 7 months between the eclipse and Passover; on the 13th of March 4 BC with 29 days between the eclipse and Passover and on the 10th of January, 1 BC with 12.5 weeks between the eclipse and Passover. Most scholars favor 4 BC placing the birth of Jesus in ca. 6 BC while a few have challenged this date preferring 1 BC for the eclipse that is mentioned by Josephus and placing the birth of Jesus in 3 or 2 BC. This later date has been challenged by Barnes and Johnson who again favor the 4 BC date. Maier argues for “late 5 BC as the most probable time for the first Christmas.” The early Church Father, Clement of Alexandria (ca. 200 AD), gives a date for the birth of Jesus according to the Egyptian calendar (25 Pachon or May 20th; Strom. 1.21) which according to the Gregorian calendar converts to the 14th of May, 6 BC. Paul L. Maier, In the Fullness of Time: A Historian Looks at Christmas, Easter, and the Early Church, Rev Updated (Grand Rapids, Mich.: Kregel, 1998), 24. Dunn, Jesus Remembered, 324; Jack Finegan, E. Jerry Vardaman, and Edwin M. Yamauchi, eds., Chronos, Kairos, Christos (Winona Lake, Ind. : Eisenbrauns, 1989), 97–117; Kenneth E. Bailey, Jesus Through Middle Eastern Eyes: Cultural Studies in the Gospels (Downers Grove, Ill.: IVP Academic, 2008). Timothy David Barnes, “The Date of Herod’s Death,” JTS 19, no. 1 (1968): 204–219; P. M. Bernegger, “Affirmation of Herod’s Death in 4 B.C.,” JTS 34, no. 2 (1983): 526–531. Mark Kidger, The Star of Bethlehem: An Astronomer’s View (Princeton, N.J.: Princeton University Press, 1999), 46. Ibid., 48–49; Manfred Kudlek and Erich H. Mickler, Solar and Lunar Eclipses of the Ancient Near East from 3000 B.C. to 0 with Maps (Neukirchen-Vluyn: Butzon & Bercker, 1971). Harold W. Hoehner, “The Date of the Death of Herod the Great,” in Chronos, Kairos, Christos, ed. Jack Finegan, Jerry Vardaman, and Edwin M. Yamauchi (Winona Lake, Ind. : Eisenbrauns, 1989), 101–32; Emil Schürer, The History of the Jewish People in the Age of Jesus Christ (175 BC–AD 135), ed. G. Vermes, F. Miller, and M. Black, Rev (Edinburgh, U.K.: T&T Clark, 1979), 1:326–28 n. 165; F. F. Bruce, New Testament History, 2d ed. (New York, N.Y.: Doubleday, 1980), 23. Ernest L. Martin, “The Nativity and Herod’s Death,” in Chronos, Kairos, Christos, ed. Jack Finegan, Jerry Vardaman, and Edwin M. Yamauchi (Winona Lake, Ind. : Eisenbrauns, 1989), 86; W. E. Filmer, “The Chronology of the Reign of Herod the Great,” JTS 17 (1966): 283–98. Barnes, “The Date of Herod’s Death,” 204–209; Douglas Johnson, “The Star of Bethlehem Reconsidered: A Refutation of the Mosley/Martin Historical Approach,” Planetarian 10, no. 1 (1981): 14–16. Paul L. Maier, “The Date of the Nativity and the Chronology of Jesus’ Life,” in Chronos, Kairos, Christos, ed. Jack Finegan, Jerry Vardaman, and Edwin M. Yamauchi (Winona Lake, Ind. : Eisenbrauns, 1989), 113. After about one year of editing and working on this work it is finally completed. New modern easy-to-read layout, over 250 photos, maps, and charts. 291 pages in full color or black and white paperback. Includes a table of images and full index. 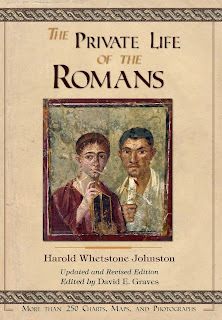 Harold Whetstone Johnston was a gifted teacher, noted classical historian, and professor of Latin who first published this work in 1903. 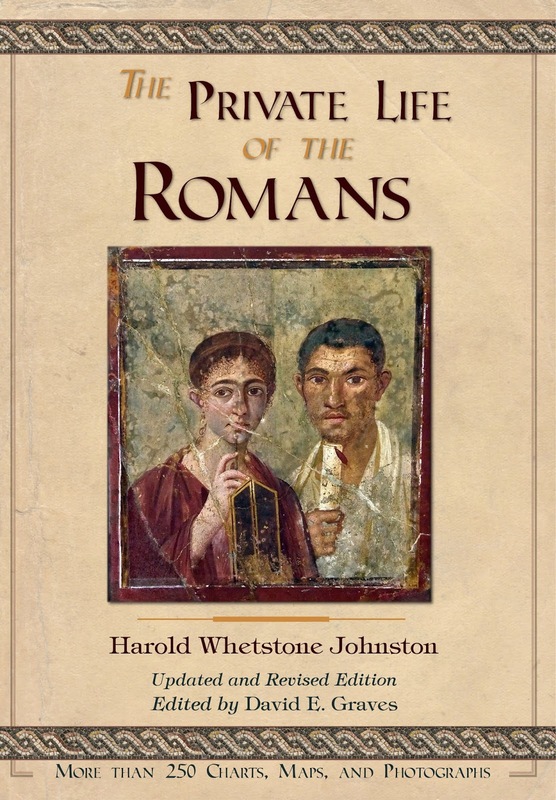 It quickly became one of the most widely read works on the life of the Romans. The original work was written for college students and amateurs interested in the private life of the later Republic and early Roman Empire. It was one of the only books of its kind used by students reading Roman literature from Cicero (106–43 BC) to the close of Hadrian’s reign (138 AD). The original bibliography only contained secondary sources, but Johnston did not list primary sources as he assumed that his intended audience would not have the original languages. This newly revised edition is based on the 1909 text with the language updated for the modern reader. This edition has included a completely new typeface and page layout and design that makes it easier to read. The content of some of the chapters was reorganized to better structure the material. Numerous illustrations, and over 250 contemporary photographs were added to replace many of the older illustrations and provide the most recent archaeological research. An updated bibliography and index of subjects are also provided to assist the user in accessing the material. Johnston had originally numbered his paragraphs to locate material throughout the book, but this numbering system was replaced with a more traditional updated footnote format. It is the hope of this editor that this present work will continue to assist high school and college students, or others who want to know more about the realities of life in ancient Rome. Black and white paperback (ISBN: 978-1726864916) from Amazon; AbeBooks; Alibris; Blackwell; and Book Depository. Full color paperback (ISBN: 978-1727139952) from Amazon; AbeBooks; Alibris; and Book Depository. During a debate in 2012 between professor of New Testament at Dallas Theological Seminary, Daniel B. Wallace, and agnostic Bart D. Ehrman, Wallace announced the discovery of an early fragment of the Gospel of Mark. The small fragment (4.4 x 4 cm) from the foot of a well-preserved papyrus codex leaf has been published as Oxyrhynchus Papyrus LXXXIII 5345 and contains Mark 1:7–9, 16–18. Although originally believed to date to the first century, a second/third cent. date, recorded in the publication Parsons and Gonis, eds., The Oxyrhynchus Papyri, vol. 83 and is confirmed by the Oxford papyrologist Dirk Obbink who published the fragments, has been ascribed to the fragment. Of interest is that in Mark 1:17 instead of αυτοις ο Ιησους (autois ho Iēsous, “to them Jesus”) the papyrus does not have ο Ιησους (case of ho Iēsous, “Jesus”). This may be a case of nomen sacrum which is a “sacred name” that is abbreviated, in this case ΙΥ with a supralinear bar over it. This may help in the dating as these nomina sacra are all found in Greek manuscripts of the 3rd cent. AD. However it is more likely that this is a case of parablepsy where a scribe is distracted and his eye omits the text. Note that the two fragments are an example of opistrograph and actually one piece, but written on both sides, front (recto) and back (verso). The recto and verso are displayed together side by side for illustration purposes. This discovery further supports an early date for the writing of the Gospel of Mark. This would be older than Papyrus 45 (housed in the Chester Beatty Library in Dublin), which is dated to the first half of the third century and considered the oldest NT manuscript to date. It contains the texts of Matthew 20-21 and 25-26; Mark 4-9 and 11-12; Luke 6-7 and 9-14; John 4-5 and 10-11; and Acts 4-17. The fragment was excavated by Grenfell and Hunt (ca. 1903 based on its inventory number (# 101/14(b)) and is now held in the collection of the Egypt Exploration Society. They provide further details of the history of the Mark fragments. Candida R. Moss and Joel S. Baden, “Why Did the Museum of the Bible’s Scholars Destroy AncientEgyptian Artifacts?,” The Christian Century, November 29, 2017, . Peter John Parsons and N. Gonis, eds., The Oxyrhynchus Papyri, vol. 83, Graeco-Roman Memoirs (London, UK: Egypt Exploration Society, 2018), 5345. For a recent discussion of nomen sacrum, see Larry Hurtado, Earliest Christian Artifacts: Manuscripts and Christian Origins [Grand Rapids: Eerdmans, 2006], 95–134. For more on other similar biblical fragments recently released see LINK.